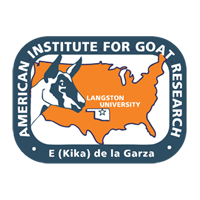 Two experiments were conducted to determine appropriateness of conditions in a method being developed for evaluating efficacy of different electric fence additions to cattle barb wire fence for goat containment. In Experiment 1, two 6 × 6 Latin squares (LS), each with 24 yearling Boer goat doelings previously exposed to electric fence, were conducted. After overnight fasting, groups of four doelings were placed in 2.4 × 2.4 m pens without forage. One pen side was five strands of four-point barb wire (non-electrified) at 31, 56, 81, 107, and 132 cm from the ground adjacent to a pasture with abundant vegetation. One LS had periods 2-3 days in length and the other 7 days. Electric fence treatments for each square were addition to barb wire fence of four electric fence strands 15, 28, 43, and 58 cm from the ground at low voltage of 4-4.5 kV (4S-LV); two strands at 15 and 43 cm and high voltage of 8.5-9 kV (2S-HV); two strands at 15 and 43 cm and low voltage (2S-LV); one strand at 15 cm and low voltage (1S-LH-LV); 1 strand at 43 cm and low voltage (1S-HH-LV); and 1 strand at 23 cm and high voltage (1S-MH-HV). Percentages of doelings exiting (6 and 4%) and shocked in 2 h (15 and 16% for 7 and 2-3 days, respectively) were low and did not differ between period lengths. The percentage of doelings exiting in 2 h was not affected by fence treatment. Period of squares affected (P < 0.05) the percentage of doelings shocked (54, 25, 4, 6, 0, and 4% for periods 1, 2, 3, 4, 5, and 6, respectively). Experiment 2 was with 30 Boer and 30 Spanish growing doelings in the same study area. Because of less than anticipated shock and exit in Experiment 1, some conditions were changed, including a defined period of exposure to electric fence, training for pen exit before the experiment, and longer fasting (24 or 36 h). Fence treatments were those of Experiment 1 but without 4S-LV and with slightly lower voltage. Doelings were divided into three sets of 20 and used in a completely randomized design (CRD), and one set continued repeated exposure to the different fence treatments in a 5 × 5 LS. Thereafter, period 1 was repeated in period 6. For the CRD approach, the percentage of doelings exiting in 1 h was greater than 90%. With the LS method the percentage of doelings exiting also was similar among fence treatments but was 75, 70, 40, 70, and 75% for 2S-HV, 2S-LV, 1S-LH-LV, 1S-HH-LV, and 1S-MH-HV, respectively. With a comparison involving doeling sets used in the LS, the percentage of doelings shocked was lower (P < 0.05) in period 6 vs. 1 (5 vs. 50%), although there was no difference with doelings not used in the LS. In conclusion, results were not promising for successful use of a LS approach, and large differences between experiments in levels of shock and exit indicate need for further change in conditions.